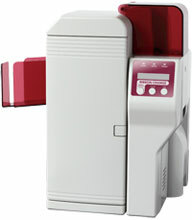 The NiSCA PR5360LE has been discontinued. No direct replacement is available. The PR5360LE offers a small foot-print, 24-bit color, 256-Grayscale, security lamination, encoding options and prints at the astounding speed of over 164 cards/hour and 16MB of memory! The PR5360LE joins the PR5300 series of printers and has the same NiSCA quality, manufactured in their ISO certified production facility. 10 Mil Printer, 10 Mil Cards Only!